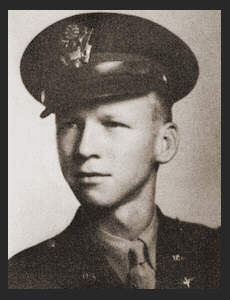 First Lt. Charles D. Allen, son of Mr. and Mrs. J. C. Allen, graduated from Weaver High School; husband of the former Helen Martin. Entered the Air Corps in Aug. 1941, trained in Sheppard Field, Texas, Independence, Kan.; Served in Italy; was wounded in action, July 1944; missing in action in Yugoslavia from April to May 1944. Awarded ETO Ribbon with four Batte Stars, Good Conduct Medal, Am. Defense Ribbon, the Purple Heart, Air Medal, DFC, Pres. Unit Citation.